Approach Resources has made a number of management changes, including its CEO departing and being replaced by its CFO (holding a dual role now). 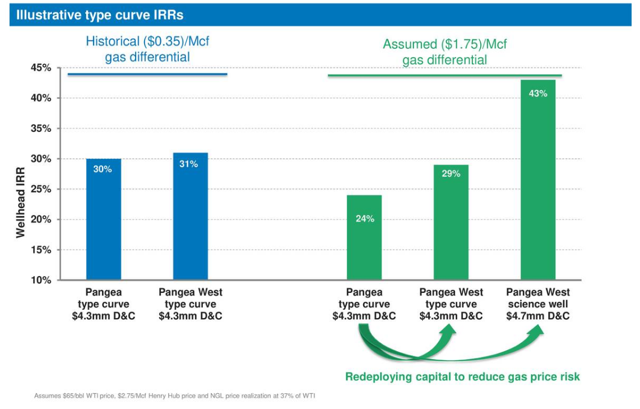 Even with improved natural gas differentials, Approach would need to reduce its G&A further and cut the majority of its interest costs to achieve a competitive breakeven level. I estimate that Approach needs to reduce its outstanding debt to around $165 million in credit facility debt and zero unsecured debt to achieve a $55 WTI breakeven point. Approach does have a large amount of acreage, but most of its acreage isn't de-risked yet. Approach's type curves suggests modest returns at strip prices for its de-risked locations. Approach Resources (AREX) announced that CEO Ross Craft has resigned from the company and is being replaced by CFO Sergei Krylov, who will have a dual role as CEO/CFO. This move (and other management changes) were the product of discussions that were previously mentioned in March. This could help reduce Approach's high G&A expenses (relative to its level of production) over the long term. However, it appears that Approach still needs to shed the majority of its debt in order to be competitive going forward. Approach is receiving a very low price for its natural gas right now due to the large WAHA differentials. WAHA basis futures are currently around negative $0.88 for 2020 and negative $0.48 for 2021 though, so I've modeled out a scenario below where Approach realizes around $2 per Mcf for its natural gas. Henry Hub futures are currently around $2.76 for 2020 and $2.68 for 2021. I've also estimated that Approach would need to spend around $40 million in capital expenditures to maintain production at average 2019 levels. This leads to a breakeven scenario at around $67 WTI oil ($64 realized oil price) for Approach. At that oil price, Approach would generate $107 million in oil and gas revenues with 2019 production levels. With $40 million in capital expenditures and an assumption that Approach can reduce its cash G&A costs by around 25% to 30% (from management changes plus further cuts), it would end up with $107 million in cash expenditures in this scenario. This unhedged breakeven point is higher than most of its peers, so Approach needs to lower its costs more to be a competitive company. To be competitive going forward, Approach would probably need to reduce its unhedged breakeven point to approximately $55 WTI oil or less. At $55 WTI, it would generate around $91 million in oil and gas revenue. To get cash expenditures down to $91 million, Approach's interest costs would need to come down to around $10 million, while also reducing cash G&A by 25% to 30% from previous levels (similar to the scenario above). Approach's credit facility had an average interest rate of around 6% at the end of 2018, which means Approach would only be able to carry around $165 million in debt at that interest rate to keep its annual interest costs to $10 million. That debt level would be around 3.3x EBITDAX at $55 WTI oil (and around 3.0x EBITDAX at $60 WTI oil), which is still a bit high, but probably in the ballpark of being reasonable at least. In general, Approach's well-level returns are fairly modest. It reported a 30% to 31% IRR for its standard type curves at $65 WTI oil and $2.75 Henry Hub natural gas along with historical differentials. At 2020/2021 strip prices (roughly $59 WTI oil, $2.72 Henry Hub natural gas and a negative $0.68 differential), Approach's IRR would probably be in the mid-to-upper 20% range for its Pangea and Pangea West type curves. Approach did report much stronger results from its Pangea West science well. However, I believe that Approach only has a sample size of one for that type of well in Pangea West, so it remains to be seen whether that result can be consistently achieved. In order to be competitive going forward, it appears that Approach will need to eliminate its unsecured debt as well as find a way to reduce its credit facility debt by at least $135 million. This is without any asset sales, as any divestitures that reduces Approach's EBITDAX would result in it needing to reduce its debt further as well. In such a scenario (where Approach restructures its debt and continues operating), it seems unlikely that common shareholders receive anything other than warrants. Common shareholders would need to hope for some sort of liquidation scenario where a buyer puts a fair amount of value into Approach's undeveloped acreage. Approach has 150,000 net acres, but hasn't de-risked most of that acreage. 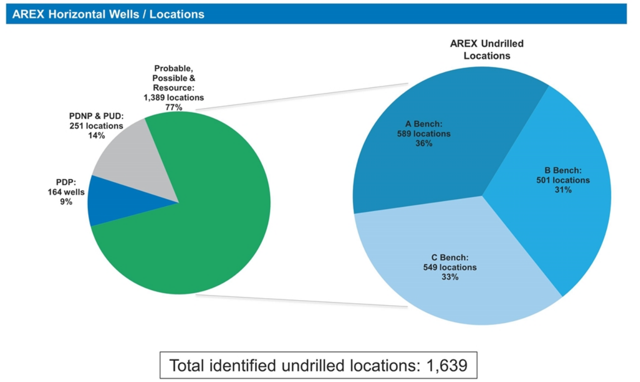 Approach had identified 1,639 undrilled locations several years ago, but had only been able to classify 15% of those locations as PUDs. Total reported PUD reserves have only increased modestly since then, so the current number of PUD locations is probably fairly similar.